Hi everyone! Well it has been a LONG time since I have last blogged but life has really gotten busy! Ellie is almost four months old, I cannot believe it! She is a healthy, happy baby and is smiling more and more each day and I am falling more and more in love with her with each wake up! We have been quite busy these last couple of months. We spent Easter in Myrtle Beach with my parents, Aunt Fran, Aunt Anna, and cousin Richie. We had a great time! Ellie did awesome in the car (9 hours)! She is such an easy baby it really scares me to have another one!! We went to NY in early May for my nephew Brady's blessing. He is such a handsome boy and his smile lights up the room! I was asked to be his godmother and am truly honored! Ellie got to meet her cousins for the first time and her Aunt Amy, Uncle G and Uncle Stevie. The traveling was tough on her. 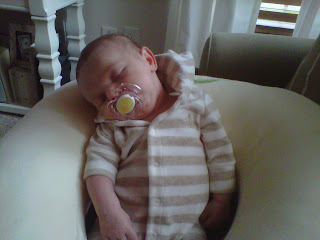 We got in late Friday night and she was so overtired and cranky and that carried on all day Saturday! She was back to her normal self by Sunday and we learned to not fly with her late at night! Brady, Ellie and Grace (and Brett too)! We went back to the beach for Memorial Day weekend with some friends and had a blast! It was so fun to watch my awesome friends be awesome mommas to their kids. I got so many ideas from them and tips and when I started to freak out about my milk supply, they were there to give me a pep talk! I am so lucky to have friends who have been there, done that! We really had a great time and look forward to many more beach trips with the Gower and Bills families! Going to the beach with kids requires work! Ellie has started to get into more of a routine which is really nice and why I hope to continue blogging regularly. She is sleeping in her crib which is great! We have a video monitor which is so nice (I recommend it!). We start her night time routine around 7:30-8ish. We give her a bath, then a bottle, then help her fall asleep. She will usually stir a few times when she drops her paci but for the most part is out for a long time. She has been waking up around 5 am (give or take a few minutes), I feed her and then she sleeps for another 2-3 hours. I feed her again when she wakes then we play for an hour and she naps again, then I feed her, we play, she naps. This goes on until bedtime. She is a great baby! We have lots of fun together. We talk, sing, dance (well I dance and she laughs at me)! She started rolling over and is growing like a weed! I tried to give her rice cereal the other day but she wasn't crazy about it! I will post pictures soon, it was pretty entertaining! 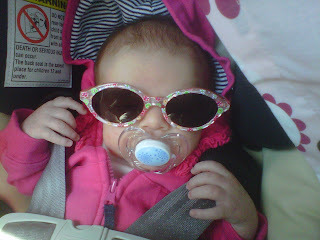 We take her to the doctor on Monday for her four month check up (seriously, where has the time gone!?!) and I will update her stats. She is such a beautiful girl and I am so lucky to have her in my life! I am taking two online classes this summer and they are far from easy! I am taking Information Systems and Management. The Information Systems class is all about computers and data and all the stuff I don't know. The content is tough but the work is pretty easy. The opposite goes for my Management class. The content is easy but way too much busy work!! I know it will all be worth it when I get to finally graduate college (probably with Ellie at this rate)! We are closing on an amazing piece of land this week! Our offer was accepted for a 3.18 acre lot in Arrington/Nolensville, TN! We are so excited! It is the perfect place to build a home to raise our family in! We hope to start building the first of the year! I will dedicate a post to this after we close (don't want to jinx anything) with pictures and house plans included! Let the fun begin! Well, Ellie is starting to wake up for her nap so I need to run. Hopefully I will be able to blog more and keep yall updated on my crazy but amazing life! Hi! I know it has been a while but I have been a little busy! Ellie is doing GREAT! At her doctors appointment a couple of weeks ago she was 8 pounds 3 ounces! She goes to the doctor on Monday and I am curious to see how much she weighs now since she has been quite the milk monster! She eats anywhere between 2-4 hours. At night she sleeps at least 3 hours at a time (knock on wood) and we have gotten the occasional 4 hour stretch which is SOO nice! 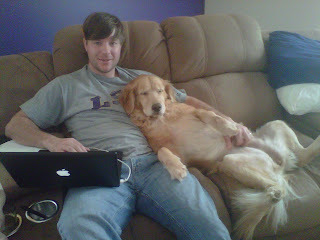 We have adjusted pretty well to having a third (human) member in our family. We still meet Brett for lunch, run errands and yes, I have time to shower! We are never on time which isn't a big deal since we weren't exactly on time before Ellie came along. The weather was beautiful up until the other day when it turned cold and gray again! Hopefully it will warm up soon so we can go on walks and spend time in the sunshine! Sunglasses are just a little big! Ellie LOVES baths! She can be screaming her little head off before we put her in the tub but as soon a her tush hits the water she is happy as a pig in slop! We have been giving her baths every other night and it is definitely one of our favorite things to do. We love watching her little facial expressions and there is nothing better then the smell of a clean baby! When I have time I will upload actual pictures from the camera but right now I am staring at a sleeping baby and I think I will squeeze in a quick nap before Brett gets home! Ellie Rose Elrod has arrived and she is perfect in every way! Here is the quick labor story. At about 8 o'clock on Saturday night I started to get contractions so Brett and I began to time them. They were coming every 4-5 minutes and lasting a minute long. We let this go on for a few hours because I didn't want to go to the hospital if I was not in labor. Since we had been taught 511 for contractions (5 minutes apart, 1 minute long for 1 hour) we decided it was time to go to the hospital around midnight. When we got there and they "checked" me they said I was only 1 cm! How could that happen?? I had been 2 cm earlier in the week! She came back an hour later and told me I was 2 cm and that when I first got there I was really closed but she didn't want to upset me. Since I was making progress they wanted to keep me and monitor me. We stayed there all night (luckily I wasn't in any pain, just anxious) and by morning I was 4 cm and admitted as a patient. They started me on pitocin to get things going and I opted for an epidural before the doctor broke my water at noon. Things moved fast after my water was broken, by three o'clock I was at 9 cm! Brett was a great coach when it came time to push and fifteen minutes after I started pushing, 7 pounds 11.5 ounces of amazing-ness was born! I cannot even explain how I felt when they put Ellie on my stomach. It truly was the most amazing moment of my life! I never felt so blessed. My labor and delivery experience was great and I can honestly say I would do it over and over to get the same feeling I had when Ellie was born. My recovery has gone well and I am feeling great. We have been to the doctor twice, for a family walk and even a quick trip to target! Ellie has taken to breastfeeding pretty well and she has been feeding about every 3-4 hours which is nice. The dogs have adjusted nicely too! These last ten days have just been wonderful!! I may or may no be addicted to babies, time will tell! We had her newborn photos taken on Monday and I cannot wait to see them. Ellie was the perfect model. She is such a good baby!! I will leave you with some pictures of my sweet little lady! Ready to go home with a huge paci! She doesn't like to be cold, obviously! Happy belated Valentine's day everyone! I hope you all had a great day like I did! My Valentine's day actually started on Sunday. Brett and I woke up and headed to church. We really want to find a church home but haven't found one that we really like. We went to the Franklin Presbyterian Church and LOVED it! I am a fan of traditional churches. I don't like bands, light shows, loud pastors, or pop church music. I like plain and simple and that is what this church was, it is perfect. We are going to continue to go and hopefully it is the right fit for our little family. So we started with a great service then went for a drive in the beautiful weather. We talked about a million things, laughed really hard and just enjoyed each other's company. We went to lunch at Puckett's in downtown Franklin and it was so good! Then we headed to Sweet CeCe's for some pregnant lady buy one get one free and it hit the spot. We spent the rest of the afternoon walking around downtown Franklin. It was perfect. On actual Valentine's day I met Brett at work and we headed to dinner at a small Italian restaurant our friends told us about a while ago, Cafe Nona. It was awesome. We stuffed our faces for sure! Brett doesn't ever want gifts. I will ask him what he wants for each holiday and it is always the same answer, "nothing". Well, I LOVE giving gifts. It is my favorite thing to do! I have gotten him boxers every Valentine's day for six years and I was so bummed when GAP was out of them! I still got some, but they weren't very festive. As a wedding gift his great friends got him two LSU paintings. One was framed and the other needed to be. Well finally after almost three years I got it framed. It turned out great and he was so excited!! It looks a lot better in person. I definitely got spoiled! Brett has really been on with his gift giving these last few holidays! He gave me a dozen red roses (roses are my favorite!) in a pretty vase, chocolates, and a new wallet. I had been telling him how I wanted to get a check book wallet so I can have everything in one place and he listened. He gave me a beautiful wallet. He did good!! Brett picked it out all on his own. He knows me well! It really was a great two days and (mushy alert...) it makes me realize how grateful I am to have such an amazing husband. He really is my best friend and we have such a great time together. We are both so goofy and laugh, A LOT! I just know he is going to be just as great of a dad as he is a husband. How did I get so lucky? We are getting Ellie's newborn photos taken the week we bring her home and I am so excited to use Chris and Adrienne Scott again. They are so fun to work with and I know they will do a great job! 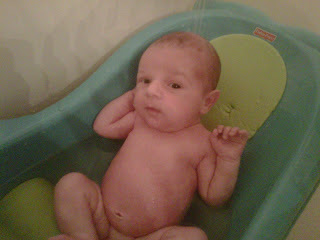 I know I want to do the nakey baby pictures but I also wanted to find something cute and simple for some shots. I found an adorable white pillowcase dress and matching diaper cover today and fell in love with it. They are going to monogram both in a light pink (I love monograms!). It should be ready in a few days and I can't wait to see how it looks. I also got this super cute spring dress for Ellie that I just have to share. I am obsessed with baby gap! They have matching shoes but they didn't have them at the store so I need to order them online. I know she doesn't need shoes but her momma loves shoes so I know she will too! And how can I not order this hat for the beach?! I promise I do more then shop for my little lady. My online class is going OK. It is a lot more work then I expected but I am getting it done. We have a midterm on my due date but luckily my professor is understanding and will let me take it after if baby comes. The class does take up a lot of time. I also have been keeping on top of chores. The bed is always made with fresh sheets, dishes done, laundry put away and most of the time a home cooked meal on the table and fresh baked goods in the cake dome when Brett comes home. Now I know to some that doesn't sound very fulfilling but I have really enjoyed being a housewife and not to toot my own horn but I am good at it! I never had a career dream, ever. I always wanted to be a wife and mom and I love that I get to do that and I am going to be the best darn mom and housewife I can be!! Life is good! Well, that's it for now. I hope my next post includes pictures of a baby! Keep your fingers crossed Ellie makes her debut SOON!! Brett and I are SO ready for Ellie to come! I will be 38 weeks on Monday and have to say I am ready to not be pregnant and to be a mommy! We are trying to enjoy this quiet time with each other but it is hard not to be so anxious for the arrival of our little lady. We have finished her nursery and have all the baby necessities ready to go all we need is baby! My amazing friends, Jessie and Jane, and my sweet in-laws threw us an awesome baby shower on Saturday. It was so nice to see family, friends and celebrate the upcoming arrival of Ellie. Everyone was so generous and Ellie got some great things. We are so blessed to have such wonderful people in our lives! Everyone wrote something to Ellie on the cards hanging from the tree, so sweet! Adorable diaper cake filled with tons of goodies! SO pale and shiny but so excited for baby. How awesome is this diaper vase my friend Sarah made? Soooo cute! Brett was excited for this LSU bib. Brett practicing with Ms. Audrey. How beautiful is she!? We finished our birthing classes last week and have a breast feeding class this week. I think the classes were worth it and I feel like we are well aware of all our options and as ready as we'll ever be!! Funny story, last week I was sitting on the couch and when I stood up, my pants were wet. I FREAKED out!! I called Brett to tell him my water broke and started throwing stuff in my hospital bag (which is now properly packed!). Brett was calm and wanted to make sure that is what happened so he asked me a million questions. Long story short, I was sitting on a very slobbery dog toy, not in labor! Not my brightest moment! We are DONE with the nursery! The end table came earlier this week and I got a lamp and a hamper. The picture we ordered with the Christopher Robin saying came in too and we love it. I can really sit in her room all day and just daydream. Posh Paints on etsy.com does GREAT work! Side table with her awesome Walmart stereo. Can't wait to jam out to some lullabies! We mastered the car seat and stroller. As you can see, we are READY FOR ELLIE! We went to the doctor last week and they said she was head down. The doctor said you could be dilated for weeks before labor and I know I would obsess over it so it was better we didn't get "checked". We are have a doctors appointment tomorrow but we are supposed to get snow today so fingers crossed it doesn't get cancelled! Starting next week we will get checked each week but I am hoping she decides to make her debut sooner than that. Now wouldn't that be nice!! As of yesterday I am 36 weeks pregnant and I can't believe it!! At times it feels like this pregnancy is going by so slow but other times it feels like just yesterday the test turned positive!! I have mixed feelings about this pregnancy coming to an end. I am SOOOO excited to meet Ellie. I can't wait to see what she looks like, how big she is and what her personality is. I am nervous about bringing her home and actually being a mom. I have to say I am so lucky to have Brett because he is amazing with kids and isn't nervous about anything. He is so supportive and I know that will be huge those first few weeks of being a mommy and daddy. I am going to miss this little lady doing gymnastics inside me and it makes me sad to think that any day now this special bond I have with her will be over and I will have to share her with the world. Of course I am excited to share her with the world (I told you I have mixed feelings!). Thank you pregnancy hormones for the craziness! Here are a couple of pictures I took of my growing belly yesterday. Please excuse the awkward poses and cheesy faces (and messy bathroom) but it is hard taking a picture of yourself! We go to the doctor tomorrow and really hope they have some good news (like Ellie is on the way!) because I am VERY uncomfortable!! I can't sleep no matter what I do. I have tried every position, every pillow, no pillows, some pillows, warm shower and calming lotion before bed, staying up super late, EVERYTHING!! And NOTHING works!! I will fall asleep but then my little melon decides to stomp on my bladder and I have to get up and pee and have to start the get comfortable process all over again! The only time I get consistent sleep is from 7:30 am- 9:30 am after Brett leaves for work. I feel bad because my tossing and turning sometimes wakes him but luckily he understands! I also find it hard to do simple things like putting on socks, walking up the stairs and getting off the couch. My body feels like it is five hundred pounds! 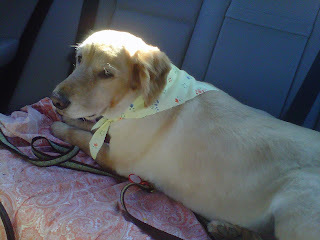 Headed home after her spa day. 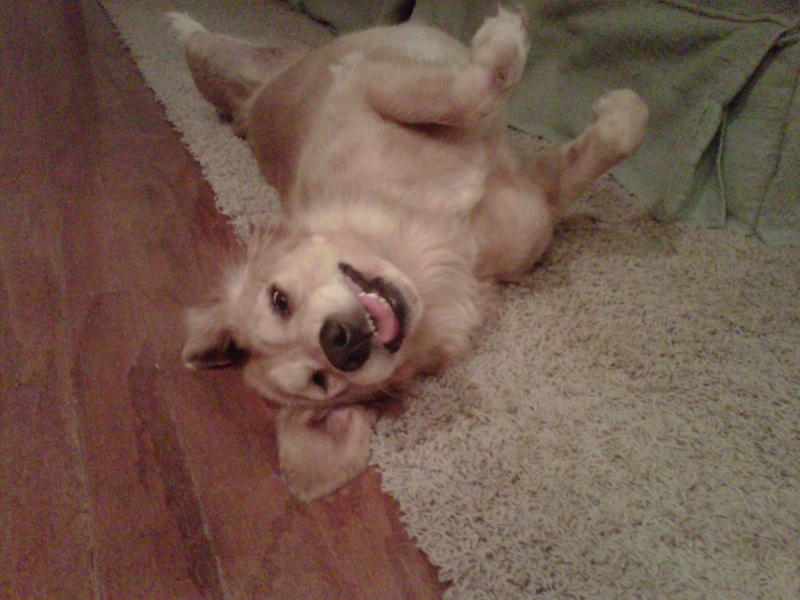 I took Cristal to the vet last week to get her caught up on her vaccinations and learned that she needs ear surgery. We have to take her in every few months and get her ears cleaned out and medicine because she has chronic ear infections and the vet said that her ear canal will eventually cave in causing infection and neurological problems. It broke my heart!! We go back next week and I am going to get more details about the surgery. He said it would be outpatient but she would be put under which really scares me. This is going to sound cheesy to some but Cristal is my best friend. I got her in college and she has been with me through everything. She is more than a dog, she is family and I will do whatever it takes to keep her healthy! She is on a stronger medication that seems to be working and I took her to the "spa" on Friday so she got a nice bath, haircut and her nails done so I think she is happy. Our weekend was really nice. We went to dinner and to see The Fighter on Friday night. I recommend it, it was great! On Saturday Brett got up and took my car to get washed and vacuumed and brought me home breakfast (he is so sweet!). We went to the mall to get the rest of my hospital things. I got a couple of nursing gowns and robes, some undies, nursing bras, and new glasses. Brett also ordered me some new slippers from LL Bean that I am super excited to get. Hopefully they will get here before Ellie comes! OK time to do some chores. Hopefully tomorrow I will have some happy news to share about Ellie's arrival!!!! 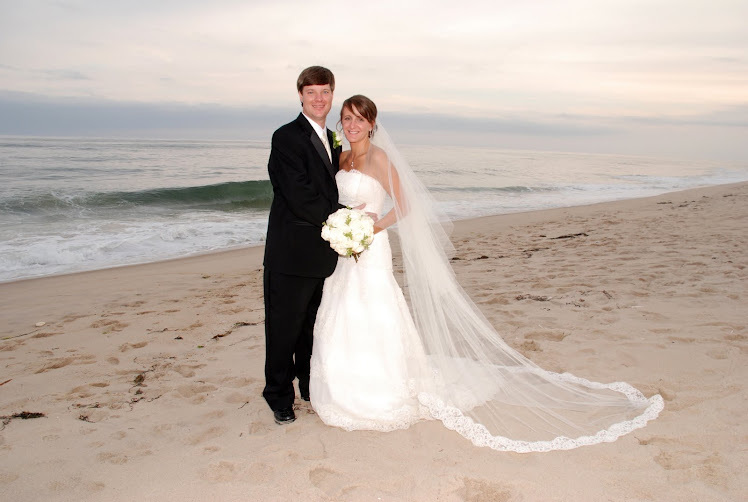 Brett and I got married in East Hampton on September 13, 2008 after four years of dating. We live in Spring Hill, TN with our two dogs, Cristal and Miles. Brett works for Franklin American Mortgage Company and I am going back to school at MTSU to finish my accounting degree. We are thrilled to be welcoming the newest member of our family, Baby E in February 2011! !